Throwing a Hank the Cowdog-Themed Kids' Party! Back by popular demand: Hank the Cowdog-Themed Party Ideas! Because of the awesome fans and parents out there who've given us such great feedback on this one over the years, we've updated and reposted it! Seriously, what could be more fun than a birthday party, or ANY party, with the Head of Ranch Security? And, so that we can share even more ideas with Hank-fans next year, be sure to email us at hank@hankthecowdog.com or comment at the bottom with any ideas you've come up with for a Hank-themed party! 1) Food: So, Hank is pretty obsessed with eating, right? Juicy, fatty ends of bacon, steak, chicken dinners, or...well, just about anything that comes out of Sally May's kitchen. When throwing your Hank the Cowdog party, be sure to take a look at our recipes section on the site for menu ideas, or some of the cute and creative ideas on that "Cowdog Party Ideas" Pinterest board. 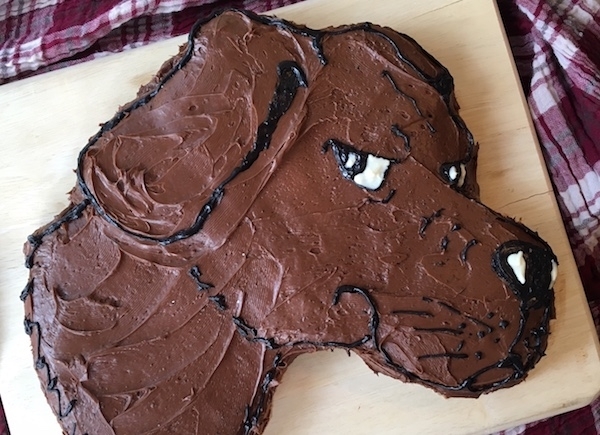 (A) Cut 2 9"x13" sheet cakes into the shape of Hank's face using THIS printout from the Fan Zone page (just print, cut, and use for guidance when shaping and icing your cake. And, a step-by-step tutorial is coming to the blog soon! (B) Or use our "Learn to Draw Hank") printout for some help in drawing a full picture of Hank a cake of any shape! 3) Games: As you know, a Head of Ranch Security has very little time for frivolous things like games, but that doesn't mean you can't have some fun at your party! Here are a few ideas... (and, remember, these are just a few possibilities! We'd love to hear what you've come up with! (A) Sharks and Minnows, DROVER-STYLE: Have all party-goers start out on one side of the yard, field or room, with one person in the middle of the room. The people at that one side will be "Drovers", while the person in the middle (doing the tagging) is called "Tuerto" (see book 8, The Case of the One-Eyed Killer Stud Horse). The two "safety" ends at either side of the yard are the "Machine Sheds." Instructions: The person in the middle will call out for the "attack" and the "Drovers" must try to make it to the Machine Shed on the opposite side of the yard. The "Tuerto" will then specify how he wants the Drovers to cross the room (running backwards, forwards, hopping on one foot, limping, etc…). Tuerto will then chase the Drovers in the same manner that he has called out. If one of the Drovers are tagged, they sit right where they were tagged and become Tumbleweeds. These Tumbleweeds have to stay on their backsides, but they can still try to tag other Drovers that are crossing (as long as the Tumbleweeds remain sitting). Any Drovers tagged by sitting Tumbleweeds while trying to get to the Machine Shed must become Tumbleweeds as well! (B) Telephone: Remember that time Hank thought the sky was falling (book 45)? And, that's certainly not the only time hilarity has ensued when Hank has misheard something... Why not play a good old-fashioned game of telephone with a small twist? (C) Group Knot: Every good pirate (book 41) knows that you can't set sail if your ropes have knots in them! Help Hank untangle this big knot of hands and arms! "When I was younger, my mom threw me the most creative Hank the Cowdog themed birthday party ever! First she set up a "crime scene" complete with rubber chickens, cracked hard boiled eggs, and ketchup "blood," all roped off with yellow tape. The guests where then tasked with solving the mystery of the chicken murderer. By following a trail of notes she had hid around my backyard and the ravine behind my house, we were led to each successive clue. At the end of the hunt, we discovered that Rip and Snort were the culprits and were let loose on two coyote piñatas. It was the best birthday I've ever had!" THAT is one AMAZING mom. (4) Music: What else?? Hank's Greatest Hits, Volumes 1-6 !!! (5) Lastly, Have Fun and Be Creative! A few years back, one mom posted some GREAT (and hilarious) ideas! Not only did she take the plunge and create a Hank cake shaped like Hank's head, she even made "Emerald Pond" out of green jello! (Now, that's creative!) Our favorite idea of hers? Pin-the-Tail on Pete the Barncat. Tee hee. Be sure to email us (hank@hankthecowdog) or comment with your ideas and suggestions! We've LOVED reading comments from readers who've had Hank birthday parties themselves! !